It seems like every other day I have a bunch of overripe bananas. This time, not only did I have overripe bananas, but I had some sourdough starter to use. Seriously, that stuff can get out of hand! It almost needs more care and feeding than my Chihuahua. Luckily, it didn't take long for me to figure out a way to put both the bananas and the sourdough starter to good use....Sourdough Banana Pancakes. Yup..I could make these every week. They are that good. Heat a griddle on medium-high. Whisk together flour, sugar, salt, baking soda, and cinnamon in a medium bowl. In another medium bowl, add bananas, sourdough starter, buttermilk, eggs, butter, and vanilla; whisk to combine. Add to flour mixture and stir with a wooden spoon until just combined. Batter should have small to medium lumps. Brush a little melted butter on the griddle. Pour the pancake batter by ¼ cups onto the griddle, keeping the pools of batter 2 inches apart. When pancakes have bubbles on top and are slightly dry around edges, about 2 ½ minutes, flip over. Cook until golden on bottom, about 1 minute. Have I mentioned how I came about my sourdough starter? Check out this box of goodies I won from Food Hunter's Guide to Cuisine. Notice the jar of sourdough starter? 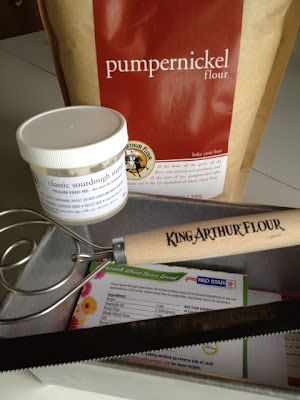 It's from the King Arthur Flour site and, apparently, has origins dating back 250 years! To make your own sourdough starter, you can visit the site and buy some of this stuff, or you can make your own. Here's a recipe I found on allrecipes.com: Sourdough Starter. Remember to not over-mix the batter. No one likes a tough pancake. The pancakes turned out awesome! Next time, I may add some fresh blueberries for an incredible banana/blueberry pancake, but, in the mean time, these were tasty with just some melted butter and some sugar-free syrup. Wow, those do look fantastic. I'm going to have to check out the sourdough starter recipe too. I can never keep that stuff on hand. one bite of these Csthy and my husband would marry you on the spot! they look awesome. they have bulk but look so light. Thanks, Peter! They were nice and light. :) Btw, I had a chance to take a look at that Ginger Cake you made....fabulous! One of my favorite things to order, banana pecan pancakes. These look great, I would have to add pecans though. Oh, yes! The pecans do sound good! Ooo! This is a must do! I should probably get a sourdough starter going. Congratulations on top 9! These sound amazing! I have never had sourdough pancakes because I am usually too lazy deal with starters...but I would love to enjoy some! The banana sounds wonderful in them! I honestly thought I had tried every pancake recipe under the sun but have never tried sourdough pancakes. Will definitely give these a try. They look and sound amazing. I had a sourdough starter going for a while that we named 'mother'. Must get her going again.